LOL – I love that the front wheel on the ‘cart’ is flat, but he’s still going. heh, “scenes exaggera” for the captcha, how apt. Nice SUV. After seeing some of the driving in India this doesn’t seem too extrime to be real. I was in Korea a year or so ago and pretty sure I’ve seen this for real or something very similar. If this is real, which I doubt, I have to wonder why bother? Why would someone want to sit up high like that when it would be so much easier to sit on the scooter and drive it directly. that is in korea, madam… not India..
That’s a motor home – and an adaptation to urban homelessness. Bunk bed upper with rain shelter. TV lower level with water and gasoline. The high seating position is this guy’s way of saying, I’m somebody smart, fun and ingenious, not a lowlife drunk. Note the fancy sunscreen hat & sun shirt, he might be a perpetual tourist. 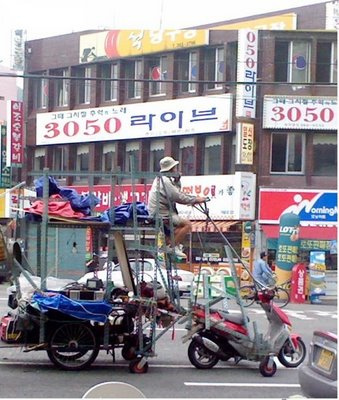 Real or not, it speaks to Korean engenuity and their ability to do much with very little. That is why tiny South Korea is one of the four economic leaders in Asia.